If there’s any U.S. city whose citizens are likely to use technology to alleviate a transit strike, San Francisco is it. On Monday, ride-sharing and car-hailing services, many fueled by smartphone apps, reported increased use after a strike halted America’s fifth-largest light rail system, the Bay Area Rapid Transit. The strike, which is over pay, benefits and work conditions, began on Friday morning, though the full effects weren’t felt until the Monday morning commute. BART is a vital commuter link between San Francisco and communities on the east side of the San Francisco Bay, including the city of Oakland. With no trains, the roads were the only alternative for many people. Sidecar, one of several services that allow riders to hail private cars via an app, said Monday was a record morning for shared rides across the Bay Bridge, which connects Oakland and San Francisco. “It was busiest second only to the last BART strike,” said Margaret Ryan, a spokeswoman for the company. She was referring to a strike in July this year that ended when BART and union workers agreed to talk out their differences. Those talks broke down last week, leading to the current strike. “We also saw a spike in ride requests this morning, with requests nearly double the previous Monday,” she said. Uber, a rival, said demand for rides was up but declined to offer more specific information. Lyft, another competitor, did not respond to a request for comment. The strike is also proving a boon to drivers who are willing to carpool. So-called “casual carpools” have existed for years for the morning journey across the Bay Bridge into San Francisco and the evening journey back. On Monday, drivers were being enticed with a $5 prepaid card for coffee in addition to the usual benefit of getting to use the high-occupancy vehicle lane for a quicker trip across the bridge. Car.ma, a new entrant to the region’s ride-sharing market, is trying to fill seats on regular commutes. Drivers enter details of their commute into the Car.ma app so riders can find people heading in the same direction. “We had an average 800 percent increase in ride searches this morning,” said Paul Steinberg, Car.ma’s vice president of business development. The average commute of a Car.ma driver is 26 miles (42 kilometers), which is very different from the shorter cross-town trips typical of its rivals, said Steinberg. The service focus is on drivers making longer commute journeys, especially from outlying cities in the area that have BART service. Sidecar. Stopping San Franciscans from playing hooky during the strike. Car.ma is part of a federally funded ride-sharing program, so the amount of money involved is different, too. Riders pay 20 cents per mile, of which drivers receive 17 cents, and drivers are capped by tax laws at earning more than 56.5 cents per mile. For passengers, it means a much cheaper ride than would be possible on other ride-sharing services, and drivers still get to cover their gasoline. Steinberg estimates Car.ma drivers took about 250 people across the Bay Bridge on Monday morning. The company is offering $25 to drivers heading to San Francisco who are willing to pick up riders in Walnut Creek, a city toward the end of the BART system. Drivers this week also get entered into a competition to win the use of a Tesla all-electric vehicle next week. 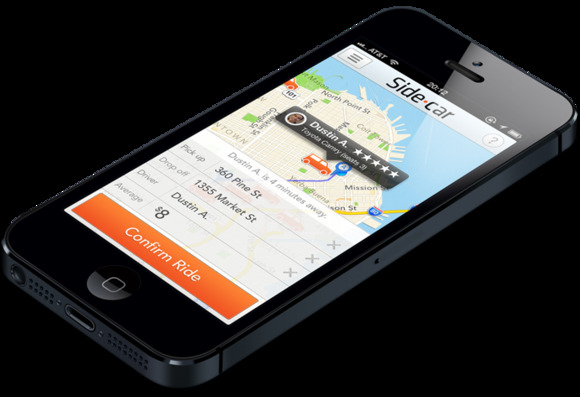 Sidecar, the car-hailing service, is starting to offer a similar service for drivers making a pre-planned trip. A new matching algorithm has been introduced so riders can be more quickly matched with drivers heading to the same approximate area. “We’ve asked all of our East Bay drivers to turn on their driver app whenever they commute, so that they can help commuters get into and out of the city, and we’ve seen a 50 percent increase in drivers online,” Ryan said.